Herbs-Treat and Taste is about herbs and spices and their uses in medicine and cookery.We give recipes and information which enable people to have a healthier diet which can prevent certain illnesses and alleviate symptoms such as a cough, sore throat etc.There is information on different herbs,their history ,what other people think or thought about them and what we think. 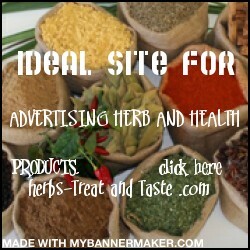 IMPORTANT DISCLAIMER: We have nothing to do with any site which offers vitamin or dietary supplements! We want you to tell us what you would like to see on our posts; more recipes, more information about the same herbs and spices, or do you want to know about different ones?If so,which? Please leave answers to these questions in the comments boxes.We have made it easier for you to do this (today). 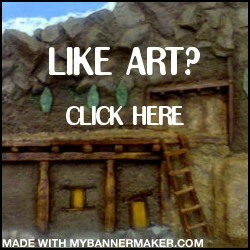 If you have any other advice or a recipe that you would like us to include, tell us (recipes will be attributed to you). Nasturtiums originally came from Peru and perhaps are also native to Chile. The original nasturtiums were brought to Europe (to Spain) by the conquistadores in the 16th century, who were also responsible for introducing Europeans to the cacao bean from which we get chocolate. These first nasturtiums were Tropaeolum minus, having a semi-trailing vine and orange-yellow flowers, with leaves in the shape of a shield. The taller variety Tropaeolum majus which had darker orange flowers and rounder leaves was introduced by a Dutch botanist much later. 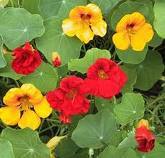 Today there are nasturtiums of various colours from off-white through to a dark burgundy colour. The official name of watercress is Nasturtium officinale, and nasturtiums were named so because they have a peppery taste like the watercress. The name nasturtium means “nose twisted” (from the Latin nasum, nose and torquere to twist), probably referring to the pungent smell of the flowers or the mustard – like oil that is released from the leaves when they are chewed. The whole above ground parts of the plant are edible, and can be used for medicinal purposes. The Incas knew about the medicinal value of these flowers and used them in salads, as can be done today. 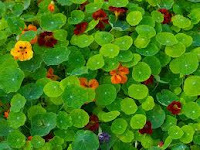 Like kachnar, marigold, violet and viola flowers, nasturtium blooms are edible and are a good addition to salads. The nasturtium is called by many names including ‘nasties’, Indian Cress, Monk’s cress and Capuchin cress, which is a reference to the shape of the flowers which resemble a Capuchin monk’s hooded cloak. I had the misguided idea that there name was “nasty urchins” and I took a long time to put this right. I used to plant seeds in my part of the garden when I was young along with sweet peas. They grow easily and reseed if left to do so, and are very decorative plants and useful too if you plant them between vegetables as they attract blackfly so sparing vegetables from this pest. They also repel aphids, ants and flies. The seeds contain fatty oil which is used as varnish like linseeds oil, and this is composed of unsaturated fatty acids (good ones). The mustard-like oil permeated the whole plant and contains Benzyl isothiocyanate which is anti-bacterial and anti-fungal. The plant is used for respiratory infections and clears phlegm from the chest in bronchial infections. It is also good for the liver, kidneys and bladder, and has diuretic properties. It is also used for skin problems, with an infusion or decoction made from the whole plant (not roots). Nasturtiums contain flavonoids such as kaempferol and iso-quercitrin, carotenoids, vitamin C, the minerals iron, sulphur, manganese and amino acids. They have antiseptic properties and act as a diuretic and mild laxative, (not as strong as senna pods or jamalgota).In the past they were used to promote menstruation, and purify the blood. An infusion of the leaves can be made into sap flakes and can be used as insecticide. An infusion or decoction of the leaves and flowers can help combat skin problems including acne. They were useful for their vitamin C content to prevent scurvy in the past when people tended to suffer from a vitamin C deficiency in winter. Nasturtiums have featured in many paintings including “La Ronde” by Henri Matisse, and just by looking at the pictures here you will no doubt see why they have been a feature in so many paintings. Monet had them in his garden at Giverney of course. The flower buds may be used as a substitute for capers, although you shouldn’t eat too many of them as they contain oxalic acid which is toxic. The flowers are delicious stuffed with cream cheese and the petals can be added to salads. You can make pickles with the seed pods in autumn too, and nasturtium and lemon butter to make a change from garlic butter, as it is good with fish and chicken. Mix the cream cheese with the garlic and freshly ground black pepper, then stuff the flowers with it. Use whole leaves of the lettuces and decorate with other salad ingredients. Mix 2 parts olive oil to 1 part white wine vinegar, add herbs or a little red chilli powder, or cayenne or paprika according to your preference, shake well and use as a salad dressing. Top with the stuffed flowers. This has Taste and is a Treat. That sounds delicious! I will try it tomorrow for sure thank you!! I can't wait to try I have three plants in my herb garden and never knew you could eat the leaves. I did use the flowers in tea once.